Climate Doomsayers Ignore Benefits Of Carbon Dioxide Emissions – Now compiled in a new report | Watts Up With That? October 12, 2015 in Positive effects of CO2. which remains fixated on the idea that news are not news unless it is bad. Hopefully, this item will get past that barrier. We will see…. It goes along with that quote from a few decades ago about how scientists and journalists have to hide any doubts that they may have from the public, because the problem is so severe that they need to panic the public into supporting them, now. The idea that CO2 might not be 100% evil, would give pause to the public and might delay their support of “what needs to be done”. The GWPF is a phony front organization dedicated to mislead the public with false information about climate change. We ignore it at our peril and if we continue on the current path, climate change will wipe us out. The earth will go on however without us and 1/2 of the earth’s species. On our present path, the sea level increases, ocean acidification, desertification and the uncontrollable migration of climate refugees (ironically already being experienced in the UK) will become irreversible. Gordon you do know don’t you that everything you have said is absolute garbage. Sea level is rising at 1.5 mm per year, the deserts are getting greener. the ocean is still very basic at 8.1ph which is a long way from being acid. 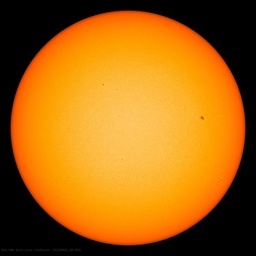 The temperature has risen 0.79 degrees C since 1880 and CO2 has gone from 0.038% of the atmosphere to 0.04%. There is absolutely nothing to be afraid of. Why are you so scared CO2 has never controlled the climate it is plant food and the increase is helping to feed the world. Relax the earth will be fine for your children. How do you define climate change? Did you actually mean to say ”Catastrophic CO2-Based Anthropogenic Global Warming? If so, why don’t you just come out and say so? The climate has changed dramatically over the past 2.5 – 3 million years. It’s what climate does. We’re enjoying an interglacial during the current ice age. If the ice cores have any validity whatsoever, we’re in for another glaciation at some point. No-one knows how long this current interglacial will last, so enjoy the warmth. Thanks again for reminding me why I’m a climate sceptic. Your post is utter garbage. History shows that, time after time, mankind prospered during the warm periods and suffered during the cold periods. If you think a bit of mild warming is going to destroy mankind then I can only say that I’m very sorry for you, you must literally be a very sad person. Yo, Gordon–the moderator is encouraging us to “question the wild and unsubstantiated claims of this poster”, which is absolutely correct. YOU live in that world of wild and unsubstantiated claims, just like Obama, who is pretty much detached from reality. Rather than fight ISIS and the horrendous misplacement of millions of refugees (among other immediate problems), you two are fixated on a problem (climate change) that exists only in your brainwashed minds. As a starter, you should seriously consider this factual report, which probably makes your head explode to realize that the gas you’ve been vilifying for decades is actually BENEFICIAL. That would be a good first step in correcting your wild and unsubstantiated claims. But I’m not holding my breath for I believe you, along with Obama, have a nefarious agenda that you’d rather pursue and if successful, it would be YOU who would “wipe us out”. You can’t destroy the world’s economy with inane “climate change” policies and not have results that would be devastating to humanity. Ironically, we’re already seeing those results. You can’t turn your back and simply ignore savages that threaten entire nations. It is ISIS that’s causing uncontrollable migration if you’d care to analyze that problem correctly. Mod: no, he gave no facts. Perhaps you would be interested to learn a little about the genuine causes of mass-immigration. Firstly, you could look at the conditions in the countries from which the immigrants originate. And then you could look at the loosening of conditions for accepting asylum seekers in the E.U. So, let us take, by example, Eritreans. Why are there so many Eritreans waiting at Calais? The Guardian asked this question (link below). If the Guardian doesn’t feel that it is necessary to blame climate change in this instance, then who does? You might also wish to ask similar questions regarding the situation in Syria. As a small hint, to help you on your way – they are having a bit of a pesky prolonged total war at the moment. Libya is having a bit of a nasty collapse into civil chaos. Somalia has been in some sort of civil war for over three decades etc. And yet you think that these people have been motivated to travel by the supposed (official) 0.8 degree rise in Global Temperatures recorded since 1880, according to GISS. Define ‘Climate Change’ for yourself, then take 5 minutes and look up how earth’s climate has changed over the past 15,000 years or so (no need to go back millions of years), none of it due to ‘anthropogenic’ causes. As for your claims, you sound just like a parrot, devoid of even the simplest ability to think about what it is you are making claims about. Relax the earth will be fine for your children. I expect that I’m not the only one here hoping that Gordon has no children and that he has no influence over other peoples’ children where he could spew the falsehoods above to impressionable minors. The irony. Agricultural scientists have been taking credit for the “Green Revolution” for more than 50 years. Now we find out that it is people driving around in cars that solved the problem of feeding the world. There is no possibility of a ‘reassessment’ within the the ‘science is settled’ community. The religious zealots accepted the Deity of CAGW and will not prey (intentional mis-pelling) at the Deity of another!….. These benefits should be added to the “social cost of carbon” calculations being used to justify the expense of CO2 controls. But I am not holding my breath. However, those benefits are currently observed and the “costs” are from somebody’s model. Who are you going to believe? Your lying eyes or our nifty super-duper model with zero (indeed actually negative) predictive ability? No, don’t hold your breath. Right now, we need all the CO2 we can get. They are. USA used three Integrated Assesment Models for estimating SCC – DICE, PAGE and FUND. The latter pedicts a net benefit up to 3°C rise. The others also include the benefits for CO2 but conclude they are outweighed by the costs. Had you been holding your breath you may now breathe again. I’m really happy that someone with “scientific qualifications” has stated that which I have been called an idiot for espousing.It has always seemed obvious to me that more CO2 would be beneficial to vegetation. How will the world’s population be able to attain obesity without plentiful CO2 to provide ever increasing food production? I’ve driven a few alarmists mad by proclaiming that on net, CO2 is a benefit to mankind. You can’t have driven them mad, when they were obviously mad to begin with. Or, as I’ve told them, if you truly want to “Go Green”, burn some coal! Yes CO2 would benefit the plants to some extent, but then again 1/4 of the world’s population and production will be under water and along with that worldwide economic, social and political collapse. At 1.5 to 2.5 mm per year your great-great- great-great grandchildren might notice the 2″ sea level change. but I doubt it. The carbon cycle is “self sustainable forever”, Gordon. Unless, of course, you promulgate policy that disrupts that cycle and then you’ve fulfilled your own evil prophecy. So I’d be very careful calling anybody an idiot when you display all the characteristics of one. See? He just parrots. Didn’t even lokk at the facts. Unfortunately Gordon, most of the people who comment here on this site have a very clear knowledge of the exact estimates of sea level rise. Both that recorded via the averaging of tidal gauges and that measured by satellite telemetry. Plus they have a good knowledge of historical records going back to the previous “glacial maximum”. Do you have any idea how small that rate of rise is? It is 3.2cm per decade. It would take 100 years to come up to the top of your wellies. AND – there is no evidence that this rate of rise is faster than that which existed prior to the proposed AGW. Sea level appears to have risen over 100 metres since the glacial maximum. Where do you get your misinformation from? Sources, please. RockyRoad. “The carbon cycle is “self sustainable forever”” Well, yes, but it occurs over timescales of millions of years. The lithosphere stores most of the Earths carbon about 80% the form of limestone. Some of this is cycled to the atmosphere through volcanoes. Quite a bit of carbon in the lithosphere is in the form of organic carbon – kerogens. The rate of cycling is measured over geological timescales. Humans extracting kerogens (fossil fuels) and burning them accelerates this to the timescale of a few years. Saying the carbon cycle is sustanable forever is totally beside the point if we are discussing the effect on human societies. As others have already noted, your claim is not based in any sort of realistic assessment of the current science. Most of the problems associated or attributed to/with Al Gore’s Warming is more than likely land use mis-management. CO2 as a plant fertilizer is actually one of the bright sides to what we collectively do to our planet. The Foreword by Freeman Dyson is well worth a read on its own account. Of course he will be written off by the alarmists as senile, but his Foreward is very lucid and shows he still has a brilliant mind. Unfortunately, only those scientists who are safely retired can afford to buck the trend. Not only that, he needed no panel of advisors to think it up for him. And he didn’t do it under a government grant – heresy. Meh. That kind of evolutionary myth-making may convince the portion of a classroom full of undergrads that hasn’t nodded off. Outside of that venue, it just sounds silly. Not to mention that it begs the question: In that case, where did the human capacity for rational analysis come from? Did it evolve over just the last 300 years? Wow. By what mechanism of natural selection did this wonder occur? The problem with just-so Darwinian stories is that they, with equal facility, can be turned around and used to argue the opposite side of just about any question you want to name. And with just as much validity. Which is exactly what makes Charles’ musings so versatile. Exactly how has that been proven true? @Xyzzy.11 Well, epistemology is the whole rub isn’t it. Which of course has been discussed plenty on WUWT. So don’t get me wrong. Watching an inside-baseball food fight is nothing if not entertaining. areas of glass growing tomatoes in GB.In the last few years it has piped in co2 from the beet processing process and improved tomato yields by 30%. CO2 may save the World from starving!! The world is not in danger of starving. For the most part enhanced CO2 allows us to reduce the number of acres needed to produce our food, allowing the rest to return to a more natural state. The world as a whole may not be in danger of starving, but the world’s poor are in danger because we use corn for fuel, which should be a crime. Corn for fuel has caused corn prices to rise and supply to diminish. I doubt the world’s poor would be happy to hear there will be a reduction in the “number of acres needed to produce our food”. Eight years ago I planted a tiny tree (terminalia sp?) in my front garden … it is now 20 metres (60 ft) tall and about 70 cm (about 28 inches) in diameter at the trunk, and branching out over the road and my neighbour’s garden. The wonders of living in the tropics. Reforesting tropical areas should never be a problem. link gets – Access Denied. Link worked for me. Looks like Dr. Williams could use some support based on the first couple of warmist comments. Nice article. Link works for me too. Great admirer of Freeman Dyson. Thank you senor. I live in the tropics of South America where Plants grow extremely large and fast…no wonder the C02 map (in the GPWF doc) over us is so green!. This C02 is ABSOLUTELY essential for this ecosystem to survive, the higher the C02 the better. The warmist cultists are absolutely mad to want to reduce atmospheric C02. I think this point should be emphasized to the greenies because they would very quickly change their minds about C02 if they knew that <180ppm would kill off all plant life! Increased CO2 results in a reduction in stoma count on leaves which reduce loss of water by transpiration. Also increases bulk of root systems allowing the plant access to more water. Additionally, some plants produce much more viable seed in a higher CO2 environment. White pine and spruce produce many times more viable seeds at 2x current CO2 levels. Not to say that others don’t also but those are the only two I have seen data for. I am guessing it would most help older species that evolved when CO2 levels were much higher than now. An example might be species on the Araucaria genus. Both Crosspatch’s point and the quote above are true and important, but both still underselling the importance of CO2 increases for helping plants deal with dry conditions. Plants require CO2 in bulk. As noted elsewhere 70% of the dry mass of a tree is CO2. Nonetheless, CO2 is just a trace gas. It amounts to only 4 molecules of every 10,000 air molecules. Hence, all plants have an enormous, expensive problem scavenging the CO2 that is necessary for them to live and grow. The difficulty is that the aqueous content of leaves is high, just as it is in all living tissue, yet an immense amount of air has to pass through the leaves to extract the necessary CO2. Thus, a lot of water molecules are necessarily lost for each gained CO2. The number is something like 800 water molecules lost for each CO2 molecule scavenged. That effect is the same in principle as the dehydrating effect of humans breathing dry air, except that for plants the problem is FAR worse, since the CO2 they need has a concentration only 1/500th that of oxygen that we need. The bottom line is that when we say “water the plants”, or irrigate the fields, or “plants need water”, or the vegetation is scanty in arid regions, what we’re actually saying is that unless a lot of water is available, plants will be unable to get sufficient CO2, and thus they won’t be able to live. Water for plants is for the most part simply replacing the water that is necessarily lost as an unavoidable side effect of the CO2 scavenging operation. What little warming CO2 does cause is mostly felt at places and times that are normally cold. Polar regions, winter, night, etc. CO2 has very little impact in regards to making hot places hotter. As a result CO2 would result in lower utility bills and fewer deaths during the winters, with little impact on utility bills and deaths during the summer. That benefit should be added to the ledger as well. Except that there is no real-world evidence that the trace gas CO₂ has ever caused any warming. 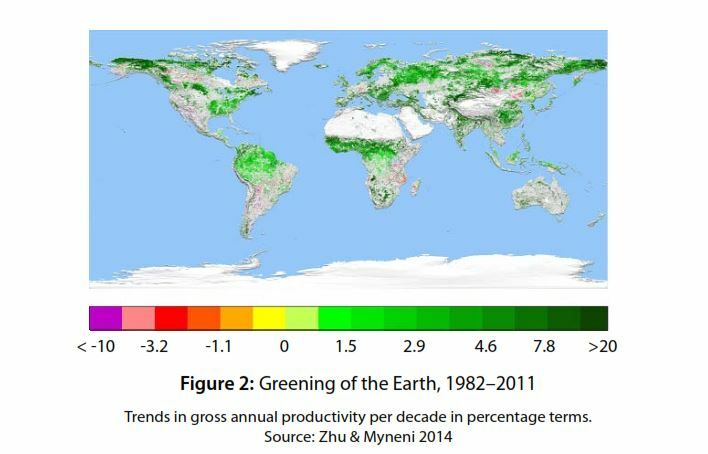 The value of CO2 is beyond mere fertilizer. CO2 is the basic chemical substrate of all life on Earth via photosynthesis. All organic material derives by bonding CO2 with water in the presence of solar energy. Trees are mostly cellulose, which is over 70 percent CO2 by weight. Starch grains make up rice, wheat, corn, potato, etc and the plants eaten by herbivores. Providing meat for carnivores. All organic fat is created from carbon dioxide molecules. For millions of years, plants have been struggling against lowering atmospheric CO2 levels. Entirely new plant structures have evolved to overcome CO2 starvation. Any botanist will tell you that putting 1000 ppm CO2 into the air will only help plant life. Calling CO2 “pollution” is insane. We should say every day that global warmist hysterics hate plants that need more CO2. One other very very important point is, when plants eat this CO2 they release OXYGEN which we need to breathe and stay alive, and huge animals like elephants need lots of this O2 to stay alive. When there is about 20% O₂ in the air the importance of your fact vanishes. And you first have to spend this O₂ to get more CO₂ through burning. If you would otherwise treat limestone by acid… it wouldn’t be important too. Where are those folks who are into cost-benefit analyses? What a truly marvelous PDF file. I’ve saved to my “ultra-special” files folder. Ultimately, what Freeman Dyson is saying is that ALL evidence points to CO₂ being a net-positive influence on the planet, on the life on the planet, on the civilizations that depend on the life of the planet, and on the oceans which buffer the planet’s oxygen and CO₂ [i]as has been the case for millions of years[/i]. A marvel of reasoned logic. Taking the 10% yield increase, that corresponds to as many as 700 Million people being fed by CO2 emissions from fossil fuels. At EPA’s value of a human life of about $9M, that gives a benefit of $6.3 Quadrillion. Now we’re talking some big numbers. Spread over an 80 year lifetime, that gives $78 Trillion per year. A 10% yield increase is equivalent to a 100,000 ppm yield increase. A 100 ppm yield improvement in crops due to around 100 ppm increase of atmospheric CO2, results in $78 billion dollars per year of benefits using EPA’s valuation of a human life. And although a Federal Interagency Working Group (IWG) estimated the social cost of carbon (SCC) to be $36/ton; the actual societal benefits of carbon – as a by-product of energy production – is 50 to 500 times greater than the perceived cost. This site maintains an ever-expanding archive of the results of peer-reviewed scientific studies that report the growth responses of plants to atmospheric CO2 enrichment. Results are tabulated according to two types of growth response: Dry Weight (Biomas); and Photosynthesis (Net CO2 Exchange Rate). As a farmer in Washington I tallied these data for 17 important agricultural crops in this State. These data show that both the Dry Weight and Photosynthetic Responses in these 17 crops increases 49.6 percent and 52.8 percent, respectively due to a 300 ppm increase in carbon dioxide from ambient. Of course all crops respond differently. Who would not want such benefits? – Craig Idso writes that advancements in technology and scientific expertise that accompanied the Industrial Revolution initiated a great transformation within the global enterprise of agriculture. More efficient machinery and improved plant cultivars, for example, paved the way toward higher crop yields and increased global food production. And with the ever-burgeoning population of the planet, the increase in food production was a welcomed societal benefit. So tell me again how this is pollution? September 17, 2014. Center for the Study of Carbon Dioxide and Global Change. Of the important agricultural crops, corn, wheat, potatoes, soybeans among other crops display a water savings of 30 to 200 percent (aka, water use efficiency or use less water) for increase in carbon dioxide in the atmosphere ranging from 300 to 350 ppm above ambient. Excerpts — In the study of Serraj et al. (1999)1, soybeans grown at 700 ppm CO2 displayed 10 to 25% reductions in total water loss while simultaneously exhibiting dry weight increases of as much as 33%. Thus, elevated CO2 significantly increased the water-use efficiencies of the studied plants. Likewise, Garcia et al. (1998)2 determined that spring wheat grown at 550 ppm CO2 exhibited a water-use efficiency that was about one-third greater than that exhibited by plants grown at 370 ppm CO2. Similarly, Hakala et al. (1999)3 reported that twice-ambient CO2 concentrations increased the water-use efficiency of spring wheat by 70 to 100%, depending on experimental air temperature. In addition, Hunsaker et al. (2000)4 reported CO2-induced increases in water-use efficiency for field-grown wheat that were 20 and 10% higher than those displayed by ambiently-grown wheat subjected to high and low soil nitrogen regimes, respectively. Also, pea plants grown for two months in growth chambers maintained at atmospheric CO2 concentrations of 700 ppm displayed an average water-use efficiency that was 27% greater than that exhibited by ambiently-grown control plants (Gavito et al., 2005). The GWPF report seems very interesting and well-written, and the foreword by Freeman Dyson is excellent. I thank him, Dr. Goklany and the GWPF for their clear and fact-based work. Since there is absolutely no empirical evidence showing any statistically significant catastrophic increasing trends of: severe weather, ocean rise and ocean “acidification”, the CAGW hypothesis has, for all intents and purposes, been disconfirmed. Even the small 0.85C of global warming recovery since the end of the Little Ice Age in 1850 has had a net benefit to our eco-system and quality of life through: less severe winters, longer growing seasons, earlier springs, fewer exposure deaths, increased arable land in the northern hemisphere, increased tree-line in northern hemisphere, slightly more precipitation (with no discernible increase in flooding), expanding ocean area for coral growth from slightly warming seas, etc. Moreover, the physics and empirical evidence show that CO2 has perhaps contributed 0.2C out of the 0.85C of total global warming recovery since 1850, which is insignificant and beneficial…. If CO2 fertilization is added to all the aforementioned benefits of manmade CO2 emissions, any negative impacts from manmade CO2 emissions (if any) become moot. I can’t believe the CAGW hypothesis is still taken seriously…. I think the only thing that is taken seriously by CAGW alarmists are ways to “adjust” raw data (i.e Karl2015) to keep the CAGW research grants flowing, despite the now overwhelming evidence that CAGW is a disconfirmed hypothesis. Never forget that the error bars on the 1850 temp guess-timate are such that none of that supposed 0.85C rise may actually exist. On the other hand it could be double that. On the other hand the real figure could be outside of the error bars. Since they are a predictor of where the real value is “likely” to lie. After all, the whole thing relies upon the activities of 1850’s sailors with buckets and thermometers, accurately providing the stats for vast areas of SST’s. And then it also relies upon the interpretation of what happened to the temperature of the bucket when this occurred as interpreted by Phil Jones et al. Personally, I think that those error bars are way too small. Even the generous BEST ones. I’ve just looked this topic up and discovered that I am not alone. CO2 is not a pollutant. Anybody who says so, has no knowledge of how science works. CO2 as a pollutant is a political notion. People keep mixing up real science with consensus science. The EPA was able to have it classified as such by ignoring the benefits of CO2 and listing only the potential costs. Under the EPA’s reasoning, rain is a pollutant. Carbon pollution is a political solution to the anthropogenic* abuse of gaia. As carbon-based organisms, we are now composed of pollution, and clean-up of pollution is the right thing to do, don’t you know…. Whenever it is a question of money or science, ….. money always wins. Hi Anthony: The submission I was trying to send along is now available from my website and the graphs are accessible within the text. My site is http//www.bcclimate.com Kind regards, Rod Chilton. “…a reassessment of carbon dioxide, which he says has many benefits for the natural world and for humankind.” I’m dumbfounded. How did such a heretical and blasphemous statement get past the AGW perimeter? In spite, of course, of the incontrovertibly obvious truth of it. Grade school biology meets the press!!! Some gratifying responses above to my “cost-benefit” request! “Atmospheric carbon dioxide is the elixir of life. It is the primary raw material out of which plants construct their tissues, which in turn are the materials out of which animals construct theirs. This knowledge is so well established, in fact, that we humans – and all the rest of the biosphere – are described in the most basic of terms as carbon-based life forms.